Our favourite wines from the Tramway Restaurant! 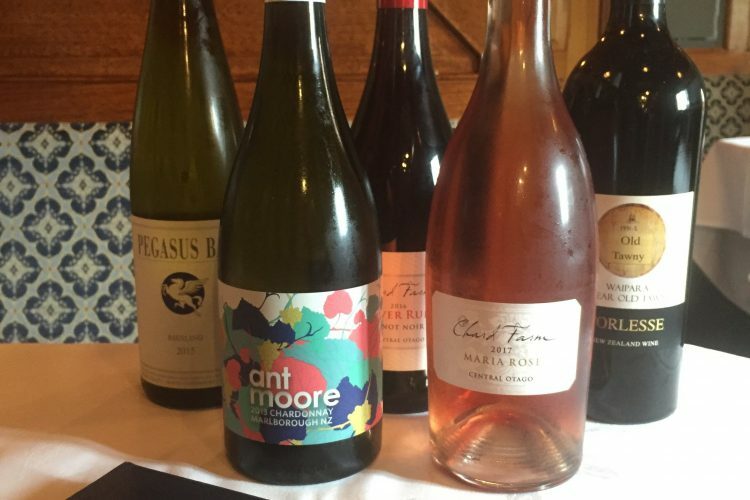 With the South Island Wine and Food Festival about to kick off in Christchurch we thought it was the perfect time to showcase some fab New Zealand wines from our Tramway Restaurant beverage list! Chard Farm – from a lovely spot overlooking the Kawarau River in Gibbston, Central Otago, we offer chard Farm’s Maria Rosé and River Run Pinot Noir on board. Both are beautiful wines with berry and floral tones, and the Maria Rosé looks great in a smart bottle showing off its vibrant colour. Ant Moore – we’re big fans of Malborough-based Ant Moore’s Chardonnay that we sell on board. The 2013 vintage is deliciously nutty, oaky and buttery, and we’re excited to try the new 2016 vintage we will have on board soon. Plus the bottles are the prettiest ones we’ve seen with beautiful floral labels! Pegasus Bay – a Waipara icon, Pegasus Bay make fantastic wines including their scrummy Riesling. Off-dry with citrus tones, the Pegasus Bay Riesling is a fixture on our wine match list as it pairs very well with many of our dishes. Torlesse – offering a range of different wines, Torlesse is just up the road in Waipara. The 10 year old Tawny is a great Kiwi substitute for Portuguese port. The Tawny has been paired with our cheese platter for a couple of years now and is a great way to end your meal on board. Plus the boxes are hand delivered to our office by the Torlesse team which is great service! We’re just as proud of the other wineries featured on the Tramway Restaurant: Greystone and Muddy Water from Waipara, Akarua and Carrick from Central Otago, Te Mata Estate and Babich‘s Syrah from Hawke’s Bay, and Dog Point, Vavasour, Allan Scott, Forrest and Peter Yealands (our welcome bubbles) from Marlborough. You’ll be spoilt for choice for a delicious drop when you dine on board!